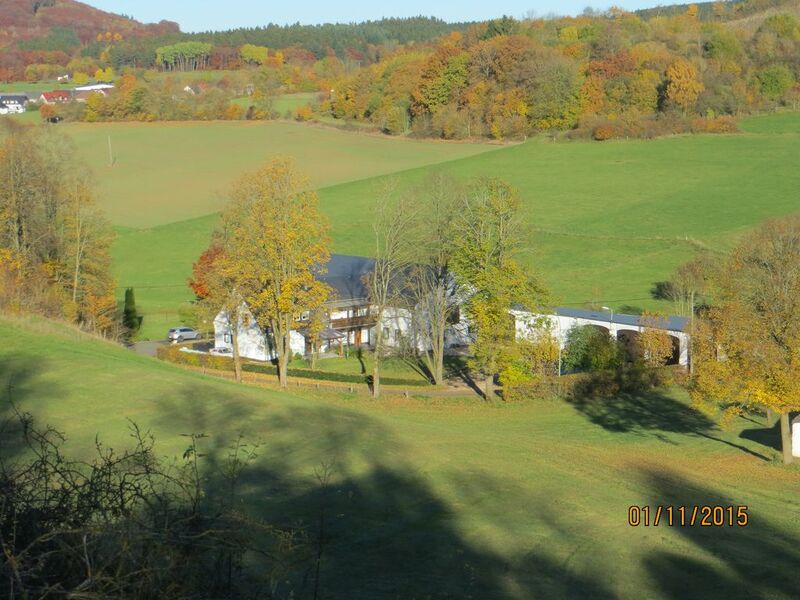 Spend your precious vacation days at the Count Hof in the volcanic Eifel! Hohenfels-Essingen is a small village in the volcanic Eifel. Just north of the village you will find the millstone caves at Muhlenberg. This arose when the recovery of millstones transitions were driven into the rock. In the nearby area you will find "pure nature" for hiking and / or biking a lot of attractions that are also your children like. Climb to the Gerolsteiner Dolomites and enjoy the wonderful views of the city Gerolstein. Then you would pay for. Example, a visit to the "Gerolsteiner Brunnen" with mineral-tasting for the effort. The Count Hof is alone lying in a quiet location with no through traffic at a dead end. Their apartments are yet centrally between the Vulkaneifel cities Daun, Gerolstein and Hillesheim (each 10 km). Due to the location with a beautiful and wide view, it is thus the ideal vacation accommodation for families with children. Two 4-star-Non smoking apartments with 115 m² or 85 m² of living space for max. 6 or 4 people offer the ideal base for a relaxing holiday. Enjoy the large garden with berry bushes and let your kids on the big playground their occupations pursue. If you like to go hiking or mountain biking, lying winning trails (z. B. Eifelsteig and Vulkaneifel walks) and the excellently signposted MTB network of Trail Park Vulkaneifel doorstep. In bad weather you can use the lounge with sports equipment, billiards and table tennis at leisure. My motorcycle or bicycle, you can find a lockable garage. Super ausgestattete Ferienwohnung in toller Lage. Können wir nur weiterempfehlen. Eifel sehr gut geeignet für Wanderungen, Besichtigung von Burgen und Fachwerkdörfern, Vulkanen und Maaren. Fijne zeer complete en goed verzorgde woning. Rustige ligging en van alle gemakken voorzien, ruimte genoeg voor 4 volwassene. Gezellig stadje (Daun) op ongeveer 15 min. afstand. Een paar extra handdoeken is het enige wat we miste. This was the first time for us to book anything via Home-Away and that process went without any problems. The apartment was indeed very nice, spacious, well-kept and clean. The house has 2 apartments and we had the smaller one. We had a balcony, 2 bedrooms, shower, bath, living, kitchen and independent front door. The hosts were very hospitable and had great tips on where to go and what to do. Also when you had questions, they went out of their way to fix it or provide answers. We were here from Friday to Monday and we mostly went sightseeing by car. Unfortunately we had a lot of rain, so we didn't do as much hiking as we wanted. Driving along the Moselle was really nice, lots of view points and old villages with old castles. The Maare near Daun are a nice sight too. All in all it's just a great country-side to drive through. 1) The smell in the hallway was a bit 'farm-ish', but in the rest of the house, this was not an issue. This might be a drawback for city folk, but, really, you don't smell it anymore when you're inside for 2 minutes. But maybe you want to bring a spray-can just to be on the safe side. 2) The bedrooms had a wood floor and the second apartment was just below, so that can get a bit noisy. But if you're friends with the downstairs neighbors (ours invited us for a beer), it's workable. All in all it's a very pretty place in a very nice surroundings in the middle of Vulkaneifel. The hosts are fantastic and we had a great weekend. I would absolutely recommend this to everyone.